With the president expected to announce his pick to replace Justice John Paul Stevens in the days to come, here's a short rundown of the top contenders-- all of whom have been interviewed by President Obama and his aides. Republican sources concede that any of these candidates would be confirmed without a filibuster, based on what is now known about them. 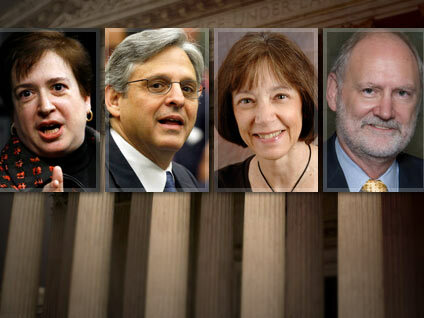 Elena Kagan (far left in the picture above), 50, the current solicitor general and former dean of Harvard Law School. She is considered the leading candidate, in part because of her reputation as a consensus builder at Harvard and her outreach to conservatives. She is widely viewed as an intellectual heavyweight, and has youth on her side. She also would be the Court's third woman justice. But the left is lukewarm on her nomination because she is not believed to be solid on issues of executive power. Republicans would portray her as a Washington insider, and slam her for refusing to allow military recruiters at Harvard because of its "don't ask, don't tell" policy. Merrick Garland (second from left in the picture), 57, federal appeals court judge on the DC Circuit. With Kagan, he is also considered a leading contender and would be the easiest to confirm, because he would get significant conservative support. He's considered the most moderate of the bunch and, in replacing liberal leader John Paul Stevens, would actually move the Court to the right. The left would see his nomination as a crushing disappointment, with 59 Democratic votes in the Senate. His nomination would mean Mr. Obama is unwilling to expend an iota political capital on the Supreme Court and instead wants to focus on his legislative agenda. Diane Wood (second from right in the picture), 59, Chicago-based federal appeals court judge. She is considered the biggest fight--and the candidate the left would most like to see. She's no bomb thrower, though. Her specialty is antitrust/business law, and she developed close relationships with superstar Judges Frank Easterbrook and Richard Posner while at the University of Chicago Law School. She now serves on the 7th Circuit with both of them, and has developed a strong reputation as an effective jurist. As a graduate of the University of Texas and its law school, she would be the only justice from outside the Ivy League. But she has decided some controversial abortion cases that would turn her hearings into a fight. Sidney Thomas (far right in the picture), 56, federal appeals court judge, Montana. He best fits the narrative that Obama has been trumpeting since he slammed the Court in his State of the Union address: That the conservative-dominated Supreme Court is out of touch with every day Americans and needs a fresh voice from outside the Beltway to understand real concerns and real people. But at the end of the day, Thomas is a risk for the White House. His opinions on some social issues could prove more controversial than Wood's, and he has been reversed unanimously by the Supreme Court in prominent cases. Republicans could turn his nomination into a real battle -- over a judge with less legal stature than Wood.